Here you can select from a variety of packages to enhance your gameplay. All items are strictly non-refundable. We recommend you read and revise our terms and conditions before purchasing anything from our store. For PayPal or credit or debit cards purchases, please use the PayPal gateway. 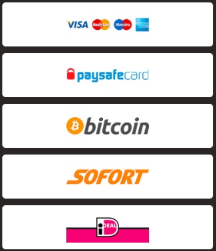 For Paysafe, iDEAL, Visa, Sofort or Bitcoin payments, please use Paygol. Make sure that the username you entered is correct and that you're purchasing for the correct player. Consult a parent or legal guardian to confirm the purchase. If you are over 18 years old, this does not matter. You have read our terms and conditions and understand that failure to comply will result in a global blacklist. SUPREMEGAMES IS NOT AFFILIATED OR SUPPORTED BY MICROSOFT OR MOJANG IN ANY WAY. Via de betaaloptie "paygol" kan je betalen met diverse betaalmethodes, zoals PaySafeCard en iDeal.